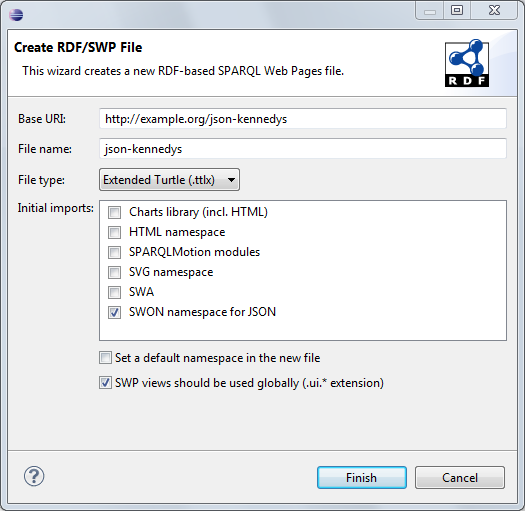 This document explains how SPARQL Web Pages (SWP) can be used to produce JSON output and to parse JSON into RDF. SWP includes a library called SWON that provides elements for JSON structures such as objects, arrays and name-value-pairs. SWP services can use those SWON elements to create arbitrary JSON text in a reliable and structured manner. This document is part of the SPARQL Web Pages Specification. JSON is arguably the most widely used result format of modern web services. This tutorial describes how to create SPARQL Web Pages (SWP) web services that produce and parse JSON. By following the tutorial you will learn about the SWON namespace (ontology) and the convenient SWP elements it provides for creating JSON. SWON abstracts away the low level syntax of JSON, so that web service developers can concentrate on the content. SWON also includes support for frequently needed design patterns such as turning SPARQL result sets into JSON objects or arrays. This document is about handling arbitrarily structured JSON. TopBraid's GraphQL support provides an alternative technology for many JSON-based use cases. 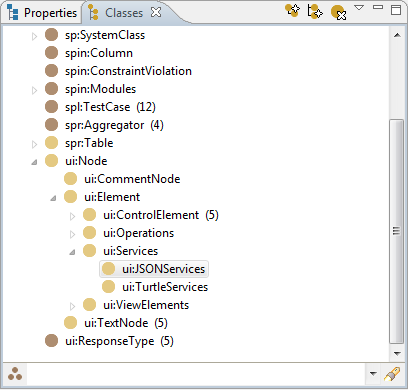 Make sure to select the Extended Turtle format (.ttlx) because this will create more readable files than normal Turtle. 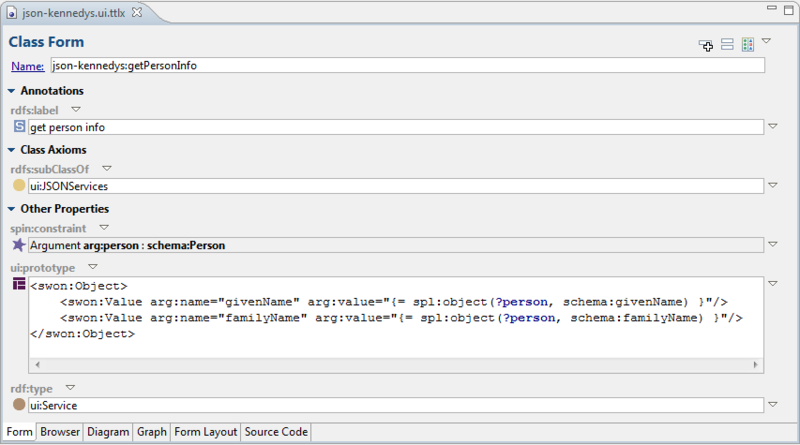 Also make sure you import the SWON namespace which includes the SWP elements for JSON generation. In older versions, make sure that the check box is activated that gives the file a .ui.ttlx extension. This file extension will make sure that the web services declared in the file can be easily accessed via a TopBraid Live web server. ui:JSONServices should be the base class of all JSON services, because it declares the correct mime type. 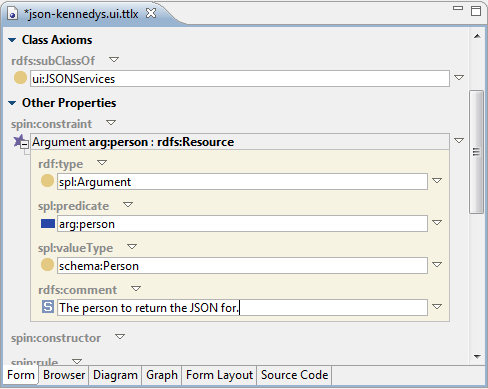 Right-click on ui:JSONServices and create a subclass, e.g. 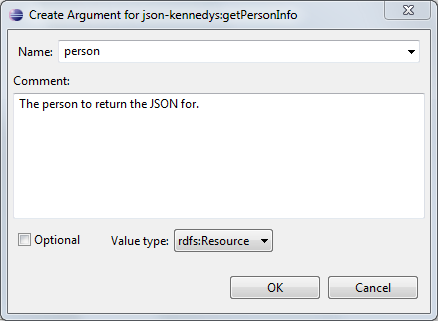 json-kennedys:getPersonInfo for the service outlined in the next paragraph. Note that if you have just created the .ui.ttlx file, you may need to tell TopBraid to update its SWP graph registry using System > Refresh TopBraid system registries. The ui:prototype uses two elements from the SWON namespace. swon:Object can be used to represent a JSON object and basically prints out the curly brackets around whatever is defined inside of the swon:Object. swon:Value represents a name-value-pair (attribute) where arg:name becomes the name of the JSON attribute and arg:value specifies the actual value. The SWON elements will make sure that characters are escaped to correct JSON syntax, so you can focus on the logic. The SWON element swon:Array can be used to create JSON arrays. In a nutshell, this element renders [ ... ] around its child elements. The child elements of a swon:Array should be instances of either swon:Object or (from TopBraid 5.3 onwards) swon:Literal. The SWON namespace includes some helper elements that can help produce better structured SWP code. swon:Comma and swon:Quote simply insert a comma or a quote character, respectively. While this appears to be trivial, it works around formatting issues with the SWP editor. swon:String produces a correctly escaped JSON string including the quotes and (optionally) a comma, for cases where a JSON structure is produced "by hand" instead of with the built-in result set elements. This section is for TopBraid 5.3 onwards. SWP can be used to process JSON, including JSON delivered by web service calls. The basic idea is that a JSON string is turned into RDF and the resulting RDF triples can be queried alongside other data. The built-in SWP element swon:parse can be used to perform this conversion while other TopBraid features such as sml:ImportTextFromURL can be used to retrieve JSON strings from a service. By default, swon:parse produces the result triples in the graph ui:tempGraph. This can be changed with the argument arg:graph. If you need to access the root resource (above, the blank node of type swon:Object, you can add child elements into the swon:parse elements and access the variable ?json, or any other variable specified by the argument arg:varName. Here is a complete example that requests JSON from a given web service, parses the JSON and then walks all name-value pairs of the returned JSON object. As an alternative to swon:parse, see also ui:json.